Pomelos can be purchased at most Asian markets and sometimes in regular supermakets and grocery store chains, depending on where you live. Pomelos are sweeter and milder than grapefruit, and often juicer, plus very low in calories. 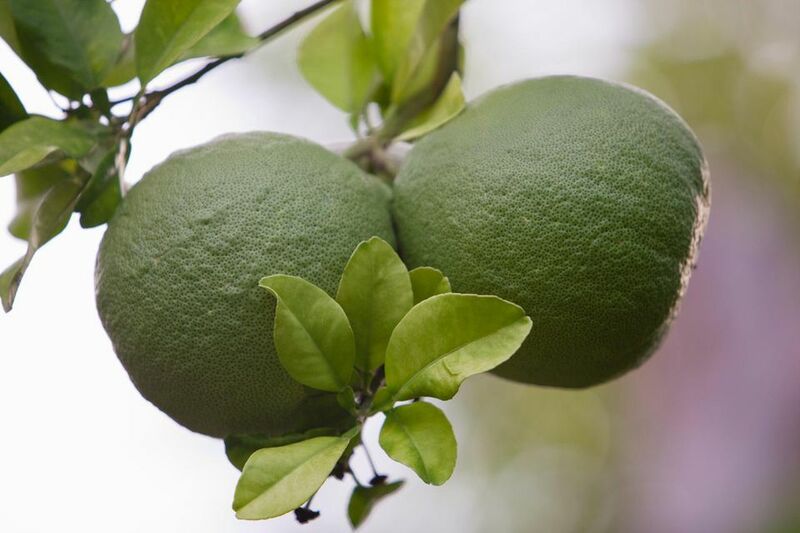 Pomelo is considered to be "king of the citrus fruit kingdom" for its sheer size. Some varieties are the size of a small basketball, while others appear like an enormous grapefruit. Pomelos also vary in color, from dark green on the outside to a coral-orange color and sometimes even yellow. The skin can be very thick (up to 2 inches), or thinner depending on the hybrid. Some come to a peek on top (where the stem joins the tree), while others are completely round. The inner fruit ranges in color from white to pink. Like other citrus fruit, pomelos are high in vitamin C (one serving of 1 to 1.5 cups gives you more than your recommended intake of vitamin C). Pomelos also contain iron, dietary fiber, and protein, yet pomelo is very low in calories: 100 grams or 0.220 lbs/3.53 ounces = 38 calories, according to the National USDA Database for Standard Reference (Pomelo Calorie Information). Pomelos are grown in Thailand (where it is known as "sum-oh") and throughout Southeast Asia, as well as in Mexico ('toronja' in Spanish) and California. Along with Thailand and China, California is now one of the biggest producers of this fruit. Completely remove the pomelo from its outer peel/shell and discard. Now you have a choice: either peel off all the white skin from the whole pomelo (as shown here) OR break it apart first by pressing your thumb into the top and pulling down on the sides. You can now break it into sections and remove the white peel from each section (at this stage it is like preparing an orange -- use whichever method you prefer). Break the pomelo into sections, removing as much of the bitter white peel as possible. Note that the fruit may range in color from white to pink depending on the variety/hybrid you have purchased. Your pomelo is now ready to be eaten fresh or used in your cooking. In Thailand, fresh pomelo is often eaten with just a little salt and chili sprinkled over.